Women must overcome so many odds to make it to the top. Unless we’re willing to take extraordinary measures, we’ll likely never make it. But there’s good news – this coming January promises a record number of females in top leadership positions in Fortune 500 companies. 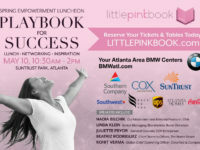 Plus, Little PINK Book’s latest research shows nearly 30 percent of working women say they aspire to reach a senior level position. Our Top 10 Women in Business list is filled with CEOs, CFOs, presidents and more. Each has a story of pushing past barriers that stood between her and career success. And they give back – many serve on boards and have created mentoring and networking opportunities for other working women. They have faced obstacles all of us can somehow relate to. They’ve endured long-term disease and the sudden death of a spouse. They’ve had to fight through the recession and learn it’s OK to say ‘no.’ They’ve faced challenges with life/work balance and “working mom guilt.” They’ve had to search within themselves for power to succeed. These women have risen to the highest positions in business. Along the way, they’ve shattered long-established barriers and become an inspiration for the rest of us.